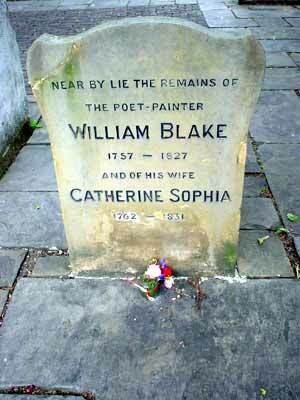 You can find the surprisingly modest grave of the poet and artist William Blake in the tranquil graveyard at Bunhill Fields, LondonEC1. Bunhill Fields once covered a much larger area being one of three great fields in the Manor of Finsbury. From 1315-1867, the Corporation of London leased the fields as a burial ground and some very notable people are buried here, including Daniel Defoe (author of Robinson Crusoe), Joseph Hardcastle (Anti-slavery campaigner) and Susanna Wesley (Mother of John Wesley, founder of Methodism).